Do Producer’s Choice Acousic Blankets shrink after wash? 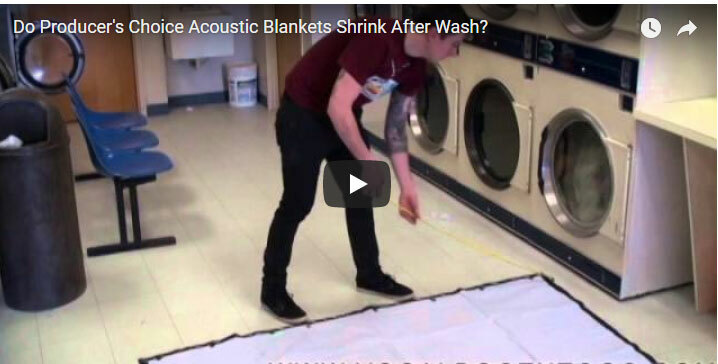 In this video we tested how much sound blankets shrink after wash. Producer’s Choice acoustic blankets shrink about 1-2 inches in length and width after the wash. This happens because the blankets expand and get thicker. This video also provides an interesting example of Producer’s choice acoustic blankets in action. Most of the audio is done in an untreated environment of the Laundromat. The end summary was recorded using the same camera, but surrounded with Producer’s choice blankets. There is a big difference in the quality of recording. This entry was posted in Producer's Choice Acoustic Blankets, Videos and tagged Acoustic blankets, acoustic foam, acoustic room treatment, recording studio, sound blanket, Sound blankets, sound booth, soundproofing, voice over booth.